Two yellow finches fritter away a hot July afternoon among the flowers at Shelburne Farms, and its easy to imagine yourself back in the early 1900s, when Lila Vanderbilt Webb was still in charge of the garden. 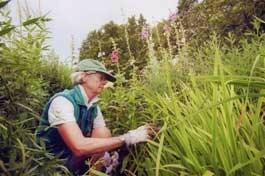 For the past 17 years, Birgit Deeds has carried on her predecessors passion for planting by tending the beds of annuals and perennials overlooking Lake Champlain. As head gardener, a volunteer position, the 67-year-old Charlotte resident is keenly aware of the legacy. On less than an acre, the terraced garden flourishes behind the Inn at Shelburne Farms, a sprawling, 19th-century, Queen Anne-style mansion that was once home to the railroad-wealthy Webb family. Frederick Law Olmstead, the landscape architect who designed New York Citys Central Park and Montréals Mount Royal, helped plan the Webbs agricultural estate on a 3000-acre Chittenden County spread. In contrast, decked out in shorts and a green baseball cap atop cropped white tresses, Birgit Deeds is tan from toiling under the blazing sun. She grew up in Connecticut but always summered in her native Denmark. Between April and October, Deeds spends two to three hours a day  often on weekends as well  keeping Lilas dream alive. SEVEN DAYS: How close is the contemporary garden to Lila Webbs version? BIRGIT DEEDS: When she died in 1936, her daughter-in-law planted a lot of hosta beds that disrupted the design. Then, the garden was neglected for many years. But when restoration of the main house began in 1984, the goal was to restore the garden according to the original scheme. We had Lilas plants to work with, lists she kept and her journals and letters in the archives. SD: Can you explain her scheme? BD: At first, she turned the rectangular parterre [an ornamental arrangement of beds in different sizes and shapes] that was here into a structured, architectural Italian garden. She brought statues and stone benches over from Italy. There was a pergola, an oval reflecting pool, a lily pond and a balustrade. But then Lila was inspired by the more informal, spontaneous English cottage-garden style of Gertrude Jekyll, a British horticulturist. That had not really been done in the United States before. SD: What flowers are growing here now? BD: Lets take a little tour. This area used to be filled with yucca, but the mice got into them. I found 10 nests. Those are hollyhocks over there. This is the grand allee, which has a progression of colors: whites and blues, then yellows, oranges and reds. Day lilies, marigolds, bee balm, coral bells. We had Oriental poppies here that died. Those tall things are plume poppies, which form a kind of screen at the edge. Heres the pink opium poppy, which has always been in the garden. We gather the seeds and sell them in the gift shop. BD: (Laughs) No, no. Just beautiful plants. SD: The DEA will be relieved to hear that. BD: Now were in the pink-and-blue section, with globe thistles, Echinacea and baptisia  which have a blue, pea-shaped flower in the spring. Thats also when the original Queen Victoria poppies bloom, along that wall. SD: What is this smaller area? BD: Lila had tea roses here. I redesigned it with 400 rose varieties. SD: The statuary is great. BD: Yes. There are lions, baskets of fruit, a boy embracing an enormous fish. As you can see, parts of the balustrade are broken. Many things need to be repaired, like the lily pond down below. We also want to do something with this shaded area that J. Watson Webb [one of Lilas sons, who died last year] started to develop. He brought other statues here from his California home, that owl and the two eagles. SD: Has this been a good growing season? BD: Probably the best. We had a warm winter and wet spring. Hard winters and dry springs are a problem. About four years ago, we had a sprinkler system installed to replace drip irrigation. The garden is at its peak in late June, though. SD: Were you experienced in garden design before working here? BD: Ive been doing it for a long time. I was an art history major at New York University but pursued horticulture and garden design as an independent study. I went to England many times, beginning about 12 years ago, to visit the Jekyll gardens south and west of London. And I took graduate courses at Harvard in garden restoration. I worked with [Charlotte landscape architect] Dan Kiley during a two-year period, and did some designs for other people. SD: Do you take care of the Shelburne Farms garden by yourself? BD: I have a helper, who also works for me at my own garden in Charlotte. Here, he comes once every two weeks to do things like deadheading. Lila had 50 gardeners on the grounds, but she did all the planning. SD: She must have been quite a lady. BD: Lila had a vision in keeping with the environmental mission of the farm. People really identify with her garden. SD: Would she have liked your alterations to her design? BD: Lila was always thinking of new things to do with it, which is why I have no problem making some changes. Its not like a painting. A garden is a work of art thats always evolving.